Passive Income From Your Digital Products? … Maybe You Can Relate? "This program has literally changed my life. I've gone from struggling to work from home with my kids, to selling my first batch of courses for clients I actually WANT to work with!" But I eventually fell in love with the business side of photography and, as an extreme introvert, my duties as a wedding photographer left me completely drained. they loved too, I just didn't know how. and felt completely overwhelmed with all of the conflicting info online! had a complete lack of traffic and engagement. So all of this to say ... I TOTALLY GET IT. order to actually, ya know, make a living from it. get off the 'ol saddle. changed my strategy (or lack of one), and spent countless hours testing and tweaking everything until I figured out what WORKED. And in less than 12 months I replaced my income from my wedding photography business and went from having 0 dollar months to $9,000+ dollar months! Which means that YOU CAN DO IT, too. Like … This Could Totally Be You, Too. from the digital products you create. the people you were meant to serve! Have complete clarity on exactly who your dream customer is and how you can serve them so that you can become the go-to leader in your niche. with engaged subscribers day after day on complete autopilot. Have an automated sales funnel up and running so that you can serve way more people without being stuck trading dollars for hours. YAS! researching, experimenting and implementing so that you can just steal all of the stuff that works and ditch the rest! You’ve finally got a step-by-step path to growing a sustainable online biz. by enrolling in the program now! you need in order to successfully build an online business that runs on passive income. ✔️ Like how to create a strong brand with a clear niche so that you can stand out, attract the RIGHT people and have tons of credibility with your audience. and how you can sell it in a non-sleazy, non-salesy way. have people to actually sell your stuff TO. ✔️ How to create sales funnels that’ll sell your stuff on autopilot so that you can serve way more people and have more time for living you life! ✔️ Plus, you’ll learn how to bust through fear and develop the crucial mindset that will truly MAKE YOUR SUCCESS INEVITABLE. "Way back in 2015, I used to feel like building a memorable and profitable blog was only for the experts. But, after finding Allison, my online business has grown by thousands of unique views & more income month, after month, after month." 💖 6 Core Training Modules filled with short, step-by-step video lessons. 💖 Video, text and downloadable slides. 💖 Workbooks, strategy maps, cheat sheets and checklists. 💖 Extra resources and tons of helpful, time-saving bonuses! Each lesson skips the fluff and ends with specific action steps for you to take so that you can easily implement what you learn and grow your biz like heck fire! Get FOCUSED on your profitable purpose. Get clear on your ideal customer and unique niche. Make sure that your brand is strong and consistent. Build credibility and authority online. Learn how to create consistent, shareable content that grows your brand and markets your business. Create the perfect freebie to explode your email list! Position yourself as an expert in your industry. so that you can save yourself loads of time + effort. Master the essential components of an irresistible paid offer so that the offer literally sells itself. that turns browsers into buyers! Create killer content upgrades in less time. Deliver your content upgrades on autopilot! Create pinnable graphics that convert. front of way more people. 47,000 new followers on Pinterest! into paying customers that grow your biz. Learn what goes into making epic sales funnels. be extra effective and convert like crazy. Explode your business with value-filled webinars. list and to make more sales. 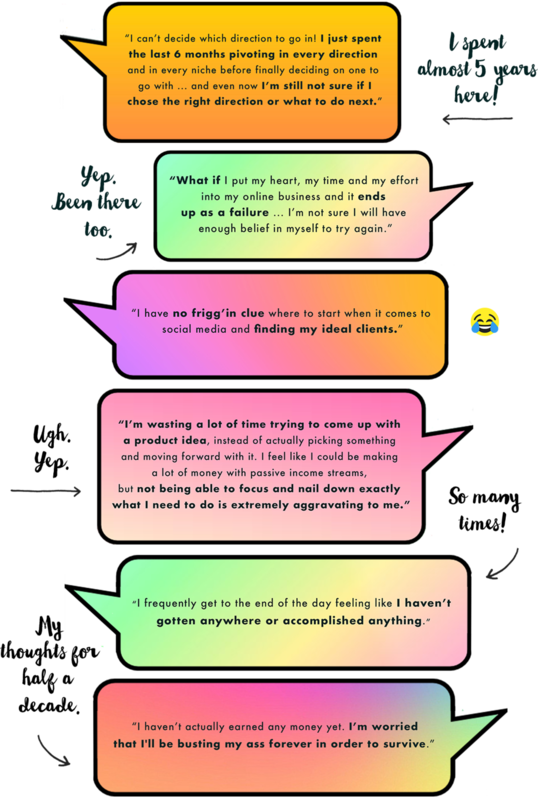 most entrepreneurs in stuck and struggle mode. get clear on your ultimate business vision! These 7 core modules are valued at over $7,000! Get the support, feedback and brainstorming power that you need in order to succeed. Plus get access to monthly LIVE office hours and "what's working right now" sessions! Want to DIY when it comes to customizing your own site? 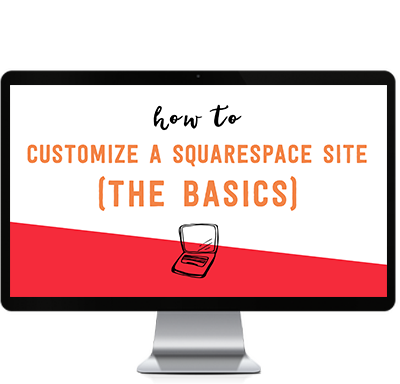 Learn the basics of simple Squarespace site customization (which is my preferred platform) and you'll be customizing like a pro! That's $1,144 worth of bonuses for FREE. Having specific action steps to take that get RESULTS. Doing work that actually EXCITES you! debt - all while working from wherever you want. the moment that you decide it is. "Allison’s course is the only paid course I’ve invested in for my business journey and it’s been incredibly helpful. 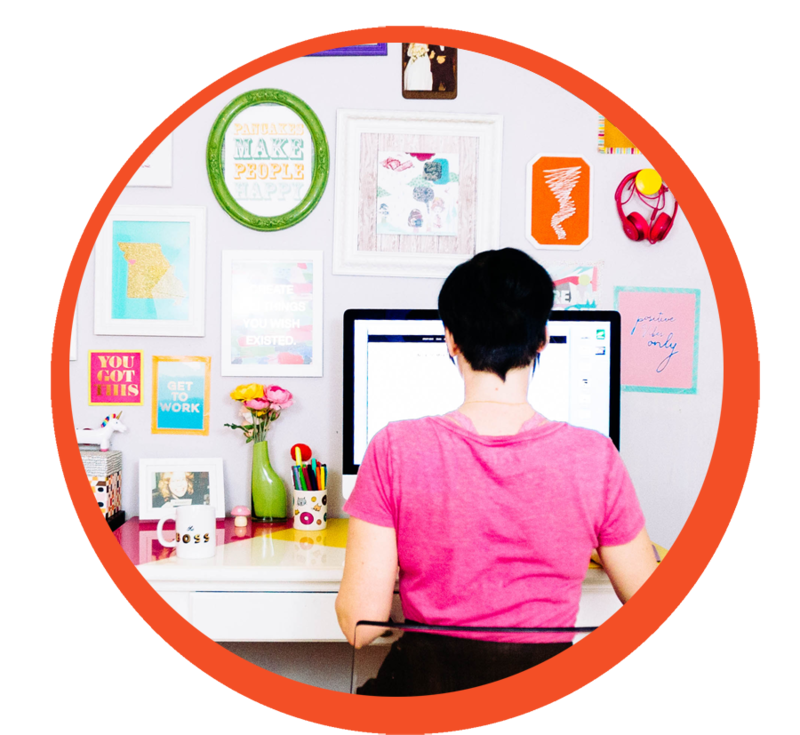 My Pinterest accounts are currently seeing a 460% and 3800% growth thanks to her strategies! Allison’s encouraging and uplifting nature keeps you super engaged in the content, and I’m so excited to see how my business continues to flourish thanks to Allison’s course!" I know that this is a value-packed program and I'm 100% confident that you're gonna effing LOVE IT. put in some work in order to be eligible. Read the full refund policy here! But you can keep my '30 Simple Tweaks & Strategies to Increase Your Revenue' video masterclass valued at $399 for FREE. You bet your brightly colored buttons, it is! others business because that's TRULY where my passion and strengths lie. are the same and will work for any industry! I've got successful students who teach photography, science, specialized autism training, help new moms breast feed and more. This isn't just another online course. that stands out with a clear message." you can reach way more people to create the impact that you desire! Does it require some consistent hard work? Yep. I've done it, and I've got students in all different industries doing it, too. And is all of the hard work worth it? "With each course, Allison's knowledge has been invaluable. My sales have been much bigger so far this year, almost double than at this same time last year! I really cannot thank Allison enough, her help has been invaluable, and the course has already paid for itself!" Julia saw more growth in 2 MONTHS with this program then she saw in 2 YEARS! She started her business in 2014, but experienced way more growth in just a couple of months since starting the course at the end of 2016.
students from all different niches are getting results! you have right now will only continue to get bigger. that continuing to try and figure everything out yourself will really help? frustrations simmer, the crappier they'll make you feel. And THAT can lead to things like failure to even launch, burnout and giving up completely. 1.) You think it's easier to just DIY everything- when in reality that ends up costing you months (if not YEARS!) worth of wasted time and effort. like this is a business investment that ends up paying for itself! Your dreams are IMPORTANT. Get started now! click here to invest in your future! Have more worries swirling around in your head? You don't need to buy expensive software. You don't even need a business idea yet! This course is for both total newbies and for experienced creative entrepreneurs. You'll either get clear on your profitable purpose OR you'll discover one- even if you have ten million ideas floating around in your head! Have limited time and money? I hear you! One of the reasons WHY I created this course was to save you time and money. It'll fast track your growth so that you can save time and help you to start actually making SALES so that you can grow your business! Give you FOCUS and CLARITY. Tell you what to do with small action steps IN ORDER. Save you SO. MUCH. TIME. Show you how to make PASSIVE INCOME, baby! Plus you'll get the support of someone whose done it already! just for students so that you can ask questions and get the support + feedback that you need! that's why we'll take it one step at a time together. Once you enroll in the program, you'll be guided step-by-step. All you need to do right now is to just take that first step! for another second! Go after it TODAY. "Allison is a super star! 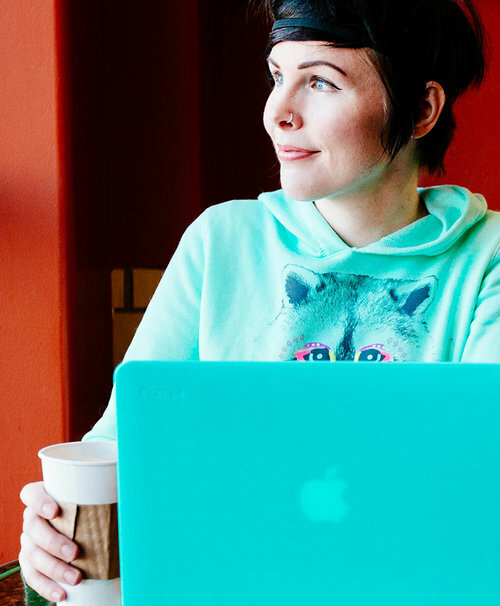 Not only is her content relevant, timely and approachable, it’s also colorful and fun. Her tools and resources have been instrumental in getting me prepared (and excited) for my upcoming relaunch! Now I feel much more confident about taking this next step." For those who want to ditch overwhelm & save time. fast track the growth in your online business! For creative online entrepreneurs of all levels. or have been at it for years, if your goal is to create a profitable online business that's fueled by passive income, then this course is perfect for you. do the work to get massive results. You're willing to put in the work that's necessary to make big changes and get results! You realize that success does not happen overnight and are committed to taking the steps in this course to create a successful online business. For people not willing to put in the time and effort. This program doesn't work unless YOU do! You need to actually put in the work if you want to see the results. will require time and effort on your part. Rome wasn't built in a day! For people who sell PHYSICAL products only. this program focuses on helping online entrepreneurs package and sell their DIGITAL info products. off of sponsored posts, affiliate income and clickable ads on their website. Trying to build a business off of things like sponsored posts and clickable ads is an outdated business model that’s MUCH harder to make work now adays. focuses on helping you build your own digital empire with your own digital products. "Allison is amazing; she is definitely a Superhero! Her material has allowed me to reach so many affected by Autism and in need of Autism training. Allison has helped this introvert grow wings and fly into uncharted territory!" "Allison is personal, encouraging and wants to see others succeed. She keeps things fun and interesting and implements methods that use my time efficiently and effectively. " It starts now and never ends! It's completely self-paced, so you decide when you start and when you finish. Woot! However, I strongly recommend that you commit to at least 15 minutes A DAY for the best results. Momentum comes from taking action and being CONSISTENT. + Will this course continue to be updated? And will I get free access to future versions? Oh heck yeah! I will continue to update, improve and add to the course. When you enroll now you will receive LIFETIME access to improvements, added content, extra bonuses and future versions of this course. + Do I need an email list? If you already have an email list (no matter how tiny), that will help. But you do not NEED to already have an email list to take this course, because I will help you start and grow your email list, even if you're starting from zero. + Do I need expensive software to use this course? + Can't I just find tons of info for free online? + What's the difference between your course called 'The 5 Day Profit Plan' and this one? 'The 5 Day Profit Plan' will get you massive clarity on your business vision + goals (including revenue!) and will then walk you through how to strategically map out your year so that you can focus on the RIGHT things every day in order to reach your biz goals. + Do I have to have a blog? Nope! While I personally love using blog posts as a way to both market and provide value to my audience, there are plenty of other types of content that you can create for your online business besides blog posts. Things like videos, podcast episodes, exclusive emails to your subscribers, live streaming, webinars and Instagram. + What if I don't have anything to sell yet? + Does this course teach me how to create a specific type of info product to sell? No, because I didn't want to limit this course to a specific type of offering (for example, JUST online courses or JUST membership sites.) However, you WILL learn how to come up with a paid offer idea (and how to actually validate your idea BEFORE you create it), so that you can create something that your audience truly wants / needs. You'll also learn how to properly launch and market your paid offering, along with how to sell it passively with sales funnels. + I'm starting from nothing (no site, no following) is this course for me? Oh heck yeah it is! If you want to hit the ground running with your online business once you start it, then yes. You'll save yourself a ton of time by having this blueprint from the beginning, and it'll probably also keep you from making a lot of costly mistakes, too. + It's a lot of money. Is it worth it? I completely understand being careful when it comes to making the right investments. (And I also realize that for some, this is a HUGE investment!) However, I created this course to prevent you from wasting your time AND money. Not only that, but I've got the testimonials from students to back it up. :-) Additionally, I've got two different payment plans to make it more affordable! of the top voices I follow and highly recommend to other small business owners." So ... what happens when you enroll in the program? Step 3: Get full access to the entire program (including additional updates, added content and bonuses) for life. Woo hoo! You can dive right into all of the modules and work at your own pace. 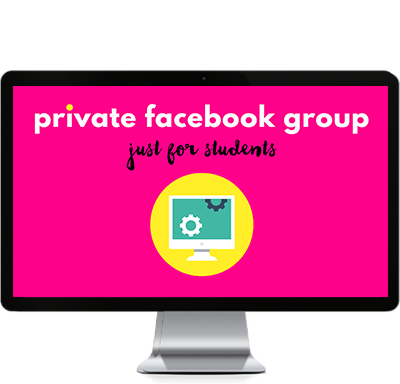 Use the private Facebook group just for students to get the support, feedback and accountability that you need in order to make big things happen! I genuinely want you to be happy so I offer a 30-Day refund policy. If you try the course and find that it's not the right fit for you, then you may request a refund for up to 30 days after you purchase the course. Simply email: customersuccess@wonderlass.com within 30 days of purchase and show me that you completed module 0 and the first 3 lessons of module 1 for a full refund. This refund policy is designed to give you 30 days to try my course, have a look around and to learn! If you do the work, put in your best effort and feel that I haven’t delivered on providing value that will grow your online business, then I will issue a full refund. I DO ask for the completion of the course work mentioned above because I only want to work with people who are as committed to growing their own business as I am. When you enroll in The Complete Online Business Blueprint, you're acknowledging that you have received and agreed to these terms. To read the full refund policy, terms & conditions plus the earnings disclaimer please click here.